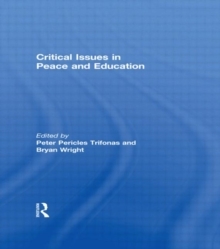 This collection asks theorists and educational practitioners from around the world influenced by the schools of feminist pedagogy, critical pedagogy, anti-racist or postcolonial pedagogy, and gay and lesbian pedagogy to reflect upon the possibilities of articulating a "curriculum of difference" that critically examines the cross-cultural issues of peace and education that are at the forefront of global education issues today. Contributors examine the conceptualizations of peace and education within, between, and across cultures through the conceptualization of pedagogical possibilities that create an openness toward the horizons of the other within communal formations of difference permeating the public sphere. They take up new ways of questions related to globalization, difference, community, identity, peace, democracy, sexuality, ethics, conflict, politics, feminism, technology, language rights, cultural politics, Marxism, and deconstruction that have a vast literary history in and outside the area of "education." This volume makes a significant contribution to the question of difference and its quintessential role in peace education for the new millennium.